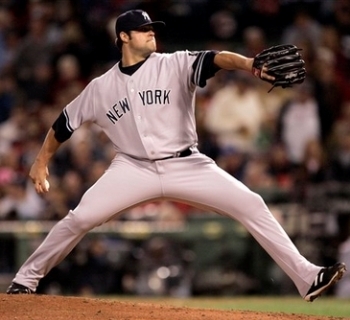 Joba Chamberlain is one of the pitchers whose pitching mechanics drove the evolution of my ideas about proper pitching mechanics, and that evolution is clearly visible if you read the pieces below. 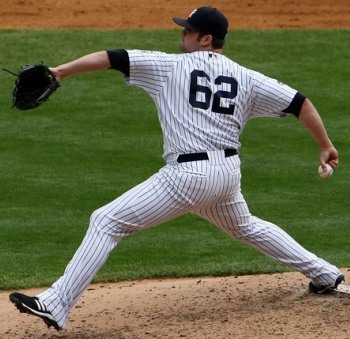 In light of Joba's recent elbow problems, I decided to revisit my analysis of Joba Chamberlain's pitching mechanics. While I believe that what I wrote holds up pretty well, three years of additional experience looking at pitchers and their mechanics makes a few things stand out more clearly. I talked about the picture above in the context of the Inverted W. I questioned whether what you see in the picture above is actually the Inverted W.
However, in the intervening years I have come to focus on timing, and the picture above, regardless of exactly what you label the arm action, does appear to show a timing problem. The thing to notice in the picture above is how Joba Chamberlain's GS foot is almost planted but his PAS forearm is not yet even horizontal. You can see the same basic timing problem in the photo above, which I focused on in 2008. In the clip above, notice the position of Joba's PAS forearm at the moment that he starts to pull back with his GS elbow. It's well below the horizontal. While Joba's arm action probably keeps his PAS forearm from getting up into the proper position on time, pulling back so hard and so early with the GS elbow is a big contributor to Joba's timing problem. As I have pointed out over the past few years, Jeff Francis, Mark Mulder, and Brandon McCarthy have experienced similar problems for similar reasons. 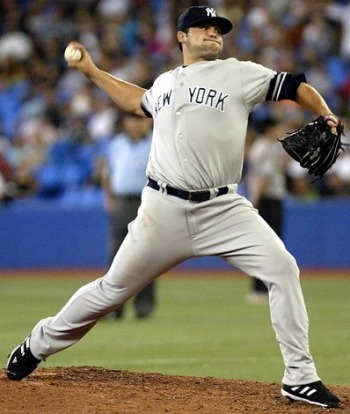 I just came across a still photo of Joba Chamberlain that concerns me, as a Yankee fan. It's a terrible angle, but it appears that he making a borderline inverted W. His arm in other images at the same point is almost vertical, so I'm not sure what to think. I believe that he has different mechanics as a reliever than he does as a starter, mainly trying to overthrow which results in him rushing. This image is from May 9th, and he had not yet been converted to the starting rotation. So there's another variable thrown into the starter vs. reliever debate. If his mechanics are better as a starter (which I believe they are), he needs to stay there. But if his mechanics are the same all the time, the only way to keep him healthy may be to limit his innings in the bullpen and hope for the best. I don't definitely see the Inverted W in Joba's arm action, in part because the angle is a little deceptive. What this may be is the Horizontal W, which would be good (or at least fairly normal). What's more, the Inverted W isn't bad in and of itself. Instead, the Inverted W (and Inverted L and Inverted V) is only bad if it creates a timing problem. Let's do a closer analysis of Joba Chamberlain's pitching mechanics, and in particular his arm action, and see if it creates a timing problem that could explain his recent shoulder problems. When I look at the photos above of Joba Chamberlain, and in particular at the photo directly above, I don't see the Inverted W. However, I do see some borderline Inverted L.
The photo above of Joba Chamberlain suggests that the first photo is a bit of an optical illusion. Again, what I see in this photo is more of the Horizontal W, which is good, and not the Inverted W. Notice that Joba Chamberlain's Pitching Arm Side (PAS) elbow is below the level of his shoulders at this moment, which is good. 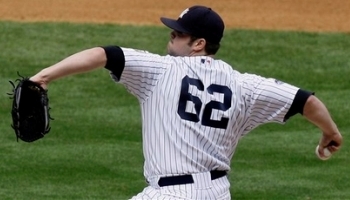 The still photo of Joba Chamberlain that concerns me the most is the one above. 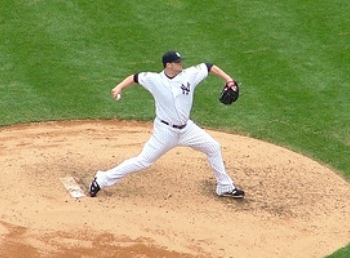 Notice that his Glove Side (GS) foot has planted, meaning that his shoulders are probably just starting to rotate, but his PAS forearm is not yet vertical and in the high-cocked position. Let's look at some video -- of the pitches Joba Chamberlain threw just before he was pulled from a game due to shoulder tightness -- and see if Joba actually does have a timing problem or if he is in the minority of pitchers whose shoulders do not start to rotate until a frame or two after their GS foot plants. If you look at the photo above of Joba Chamberlain throwing a fastball, you can see that he picks up his elbows out of his arm swing. As a result, in Frame 60 Joba Chamberlain is in a borderline Inverted L position (his elbows are a bit too low for this to be the Inverted W). This does appear to create a timing problem for him. Notice how in Frame 63 and Frame 64, as Joba Chamberlain's GS foot is planting, his shoulders start to rotate before his PAS forearm is vertical and in the high-cocked position. 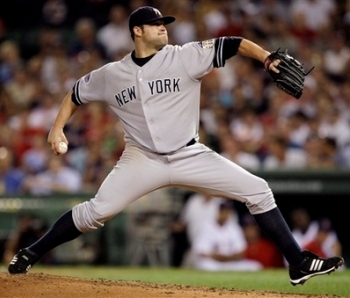 You can see the same basic timing problem in Joba Chamberlain's pitching mechanics when he throws his curveball. Notice how in Frame 79, when Joba Chamberlain's GS foot plants, his PAS forearm again isn't yet in the vertical, high-cocked position. 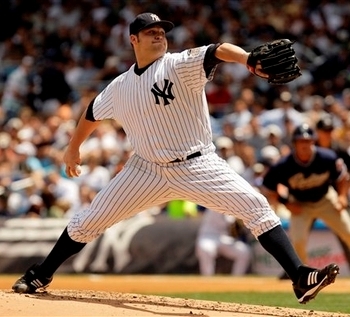 The bottom line is that Joba Chamberlain breaks his hands with his elbows, which is an arm action pattern that puts him in a borderline Inverted L position. This then creates a timing problem for him. While Joba Chamberlain's Inverted L and timing problem aren't as bad as that of BJ Ryan, it will tend to increase the load on both his shoulder and his elbow. This means that Joba Chamberlain is at an above-average risk of continuing to experience injury problems.